I decided to just grab a set without looking and make myself make a card with it. I don't think I've even used this set yet. I remember when it first came out and everyone loved it and thought it was the neatest idea. So I bought it too and there it sat in my pile, never to be used. Until now. I am not sure about the inking on this but without it, it looked really...busier. By the way that white border is part of the pattern on the paper. I cut two pieces from the same page, one of which had that border. You can't see it on the picture but the paper is really glittery. I actually made this card a few days ago but waited to post it since I've been lazy getting stuff made and figured I better space it out. Lovely card Gale! Love that big polka dot flower and I really like the colours! This is so pretty and I bet that glitter looks great IRL! I am so proud of you for using a neglected stamp set! What a fun idea, too! Love the grab bag approach to picking a stamp set! This is gorgeous Gale! I think the inking is a really nice touch. I love the papers you have used. Gorgeous card! I love the paper you used! Love that brad, it really goes well with the colors. Wow, this came out graet. It is pretty and bright and I love the polka dots. Great card. Oh, that is such a cute card! I love the color, and the inking gives it great dimension. This is a sweet, sweet card! The colors are just so pretty , I have to keep looking at it! The image is adorable, I love that flower! Great job! This is just beuatiful! I love the colors and the ribbon and I think I may have to do what you did so more of my sets get some love! Gorgeous Gale!!! Wow! It is busy, but a good busy! It's bright and cheerful! I like it! I want this set, but I keep pushing it back on my wish list for some reason. This is so pretty! 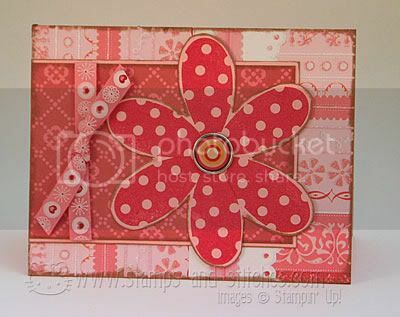 I love this card, the petals remind me of Ladybugs. Perhaps, a card could be made using the petals as wings!